The current healthcare industry is hyper-aware of the significant impact patient engagement has on outcomes. The attempt to address this critical issue is evidenced by the overabundance of meetings, conferences, newsletters, companies, engagement-focused positions, etc., and the 114 Million hits from a quick Internet search of the words “patient engagement”. Unfortunately, addressing patient engagement without providing a solution that centers on the individuality of each and every patient, leads to only minimal changes, and not to the desired outcomes. Are you leaving the full impact of your program offering on the table? Could you be setting up your program and your patients or members to be unsuccessful? Could you be integrating the wrong communication methodology that leads to low engagement and limited action? To address these significant concerns, an honest investigation of the central factor that drives engagement and true patient-centered health care success is required. That central factor is engagement-oriented communication. For us to take the concept of patient engagement and engagement-oriented communication to the level necessary for greater success, we must first define four key elements. Activation is considered a subset of Engagement and is defined as the personal willingness and ability of a Member/Patient to change or maintain a health-related behavior. Engagement is the interaction between the health care system and the Member/Patient, and is viewed as both general and specific as impacts individual activation and action. Motivational Environment is the result of a set of engagement focused variables developed by health care professionals that positively impact activation of an individual. Read more on patient motivation and motivational environments. Engagement-Oriented Communication is interaction designed to individually match patients/members in an effort to develop a Motivational Environment that leads to patient/member Activation. What is Engagement-Oriented Communication (EOC)? Engagement-Oriented Communication is any connection - email, SMS, mailed letter, phone call, landing page, poster, presentation, one-on-one discussion, etc. - between (1) the program, the program representative or health professional, and (2) the patient or member, that adheres to proper elements designed to cultivate, develop, and support a motivational environment for individual connection and action. Can Engagement-Oriented Communication be used efficiently with large populations? Yes, and it must be used. Simply put, although the foundation of Engagement-Oriented Communication remains consistent, the methodology evolves throughout the well thought-out strategy, beginning with a wide narrative that initiates the development of a motivational environment for all who are targeted. The evolution of the process continues as the patient or member progresses through to activation. Why do we use Engagement-Oriented Communication? Engagement-Oriented Communication is used because it provides the context by which real, sustainable and valuable, health-related behavior change can occur in individual patients or members. Moreover, decades of scientific evidence on the subject of behavior change supports this concept, providing the framework required for successful patient or member engagement. When do we use Engagement-Oriented Communication? Health-related behavior change is an ongoing and evolving process. Therefore, Engagement-Oriented Communication begins with the very first interaction and continues throughout the entire “connection life” between the Program and the patient or member. Although patient or member health-related behavior does evolve, the foundational principles of Engagement-Oriented Communication must remain the prominent during all forms of interactions. What are the key elements that shape Engagement-Oriented Communication? Developing a relationship takes time. 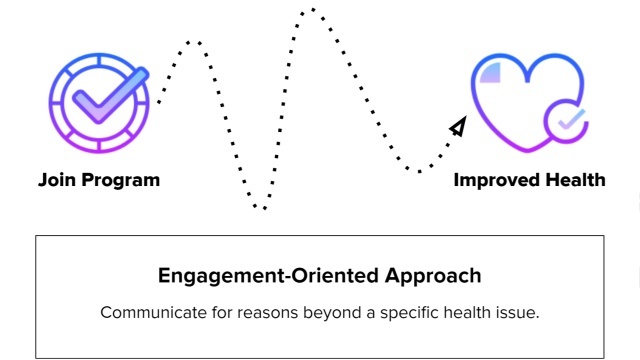 Vital to effectively addressing the goal of engagement leading to health-related behavior change is an understanding of the key factors to integrate when shaping Engagement-Oriented Communication at all levels of connection. Although a lengthy list, addressing each of these areas when developing an engagement strategy will pay dividends in the long-term success of patients or members and your Program. Element 1: Use Patient-Matched Communication. 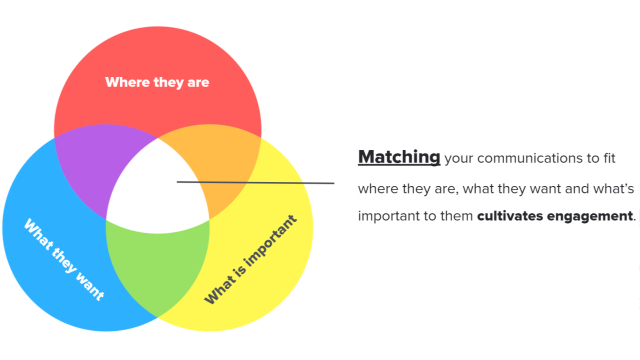 The cornerstone of Engagement-Oriented Communication, matching patient needs, wants and desires begins with the content, tone, message, timing, etc., of all forms of connections. These interactions must specifically resonate with an individual for it to potentially contribute to their personal motivational environment and therefore strengthen engagement and change. For large populations we use scientific principles to develop the required patient-matched communication at the initial stages of engagement. Element 2: Be Persona Driven. Assuming homogeneity among individuals within a targeted group for our Program is the antithesis of Engagement-Oriented Communication. Behavior science clearly identifies unique characteristics of individuals at different phases of change. Therefore, in the absence of precise data on each individual, we are able to leverage scientific facts and formulate valid Personas. Utilizing Personas is an effective and efficient method of building a communication scheme for engagement and health-related behavior change. A critical goal of Engagement-Oriented Communication is to strike a personal chord within the individual. This is accomplished by using triggers that specifically resonate within the patient or member. Although more Personas can be identified, the following 3 cover the most likely health-related behavior Personas of individuals within your targeted group that could benefit from your Program. Additionally, addressing these 3 Persona during the initial period of Outreach can directly contribute to the potential long-term success of the individual and the Program. Persona One: Not me. I can’t. I won’t. Demoralized from attempts and failures to change. Unaware of having a health problem. Aware but in denial. Not educated about the problem. No confidence in ability to change. Aware of negatives and none or few positives for making a change. Persona Two: Okay. It’s possible. Maybe. I might. Uncertain about change. Procrastinating. Low confidence in the ability to change. Aware of negatives and positives for change but are considered equal. Persona Three: Yep, I’m thinking about it. I’ll get ready. Cautious. Aware. Analyzing. Low to moderate confidence in the ability to change. Positives to making a change beginning to overtake the negatives to change. Element 3: Build Trust With Proper Tone. Health-related behavior change is difficult, serious, very personal, often negatively perceived, etc. Patients and members will only engage completely with health professionals and a Program if they are able to trust. To be successful in nurturing trust you must recognize that it begins with the first exposure to the Program and grows over time. Engagement-Oriented Communication supports the individual development of trust for your Program and involved health professionals by developing a tone that includes understanding, empathy, collaboration, empowerment, support, individuality, respect, caring, positive, calming, trustworthy, concerned, an interest in them, etc. These and others are key ingredients for the development of the appropriate tone required to increase trust and therefore likelihood to engage and take action. Element 4: Use Words Likely To Be Perceived As Intended. Each and every patient or member has different experiences that can influence the way they interpret words. Particularly as it relates to health care, patients often have negative experiences that cannot be avoided or ignored if we are to truly engage and assist in health-related behavior change. 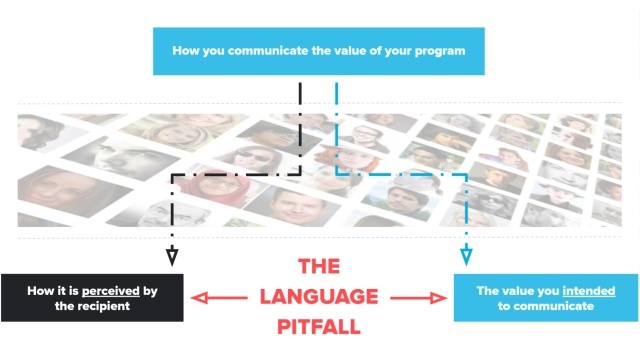 For example, content or communication relating to the value of your Program can easily be misperceived and cause less chance for engagement because of a “language pitfall”. Additionally, presenting the value of the Program or specific components etc., need to be correctly timed and only introduced after a level of trust has been built. Engagement-Oriented Communication requires the elimination of words that may have “baggage” and elicit unintended negative reactions will decrease the likelihood of misperceptions. The word exercise is a good example of how many individuals have different perceptions and often a negative response. For most people it invokes a vision of ultra fit and slim people running for miles, working out in a gym for hours, sweating, feeling exhausted, and certainly not having any fun. However, more empathetic terms that have similar meaning to exercise but result in a positive response are words like activity, physical activity, or healthy activity. These alternatives to the “You need to . . . “ avoid the negative perception and support an empowering and collaborative message that has a greater chance of leading to health-related behavior change. In both of these cases, a small adjustment can have a significant on engagement and action. Element 5: Use Plain and Understandable Words. As health professionals we have to find balance between medical related terminology and words that convey the desired meaning and are more understandable for patients or members. Unfortunately we often get caught up in the more academic side of health care and forget that the focus of our communication is the patient or member. With engagement as our goal we much foster a relationship that is collaborative and not one that is structured as “top down”. Engagement-Oriented Communication requires the avoidance of health care jargon will allow for a greater connection between patient or member and the Program. Element 6: Listen And Probe For The Why. Health professionals must realize that when it comes to Programs that deal with health-related behavior change, the statement “If you build it, they will come” is NOT applicable. Unfortunately, having an amazing Program that is designed to impact the health of patients or members is only part of the formula and unless we integrate proper Engagement-Oriented Communication our impact will never reach it’s full potential. One of the most significant elements of Engagement-Oriented Communication is changing the driving force from the Program to the patient or member. In other words, leading the engagement with an overarching theme that demonstrates your sincere interest in them as an individual and that this offering is intended to meet your wants, needs and desires. You want the engagement to be based on “why” they want to be healthy. This is contrary to many programs that focus on Hypertension, Heart Disease, Stroke, Diabetes Prevention Program, Chronic Care Management Program, etc. Patients or members are more likely to participate in a program that will allow them to do the “Thing” they can’t do because of their current hypertension. The only way to probe for this is to use Engagement-Oriented Communication that poses introspective, open-ended questions that stimulate thought beyond the numbers. As health professional who are dedicated to the health and well-being of patients and members, it is up to us to turn the current system on it’s head and place the real and most important component first, the wants, needs and desires of the individual. With dedication and commitment we can develop the proper strategy that rightfully integrates Engagement-Oriented Communication for positive health-related behavior change and successful outcomes. If you’re ready to connect to discuss your engagement strategy to drive participation and adherence in your programs, I’d love to talk. Newer PostWhat Do Population Health Management Solutions Need To Solve?